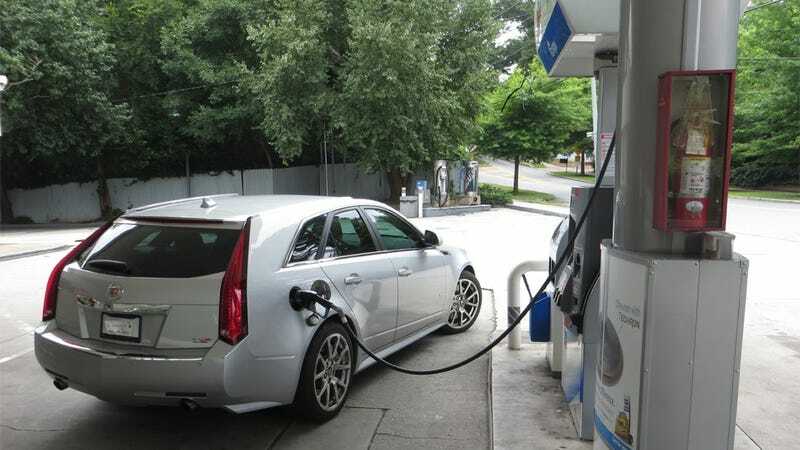 CTS-V Wagon Update: How Bad Is The Gas Mileage, Really? As you might imagine, I get a lot of questions about my Cadillac. Really, dozens. And they span a broad spectrum of inquiries, ranging from ”Is it a manual?” to the traditional follow-up: “Oh, so you’re not a true enthusiast, then?" I’m going to start with city driving because that’s what I do most. I live in a city, a rather large one, full of trees, and parks, and traffic, and municipal workers who take lunch breaks while sitting in clearly-marked government vehicles parked in “NO STOPPING” zones. And I say this because it means I haven’t turned off the air conditioning since roughly St. Patrick’s Day. (For the woefully unaware, that’s March 17, which fell this year just three days after World Kidney Day.) This hampers gas mileage, especially on the days when I cruise around with the air conditioning on and the windows down, which is highly important if I want everyone else to hear my music. I should also mention that my city driving rarely includes highways, or wide-open boulevards, or really any sort of automotive movement aside from accelerating between poorly timed stoplights. Since Atlanta’s police force is woefully understaffed, I believe this is the city’s main speed control tactic. Anyway, the conclusion here is that my city fuel economy is… 10.6 miles per gallon. This is only slightly behind the EPA’s 12 mpg city figure, and I believe the difference comes from having a heavier foot than those EPA dweebs. Plus: they don’t live in Atlanta. So city gas mileage is pretty bad. But what about when you get out on back roads and really push the thing? I’ll quote a number, but I think this description is even more telling: on most back road drives, I can literally see the fuel needle dropping. This is not an exaggeration. If you look closely, you can watch the needle go from full, to half, to empty, at which point the navigation system says “Do you want to display the nearest gas stations?” and you realize that you’ve just spent $55 to drive 92 miles. Part of the reason for this, I think, is a tiny fuel tank. Cadillac claims the tank is 18 gallons, but I think it’s much smaller, like maybe the size of a flip-flop. I hold this belief under the tried-and-true automotive enthusiast theory of “It must be the car’s fault,” rather than my own for insisting that I must exit every turn with my foot on the floor. But fine, you want a number. And that number is… 7.7 miles per gallon. Yes, it sounds bad, and it is. Believe it or not, I’ve actually seen as low as 6.7 miles per gallon during my most intense back-road driving. Ponder that for a second, ladies and gentlemen, before deciding if you really want to give up your Miata for this thing. The car does have one saving grace: highway driving. I rarely drive on the highway, but I took it out last night, set the cruise control at 65 miles per hour, and sat in the right lane, all so I could report back to you, dear Jalopnik. And the result? 17.4 miles per gallon, which is right in line with the EPA’s 18 mpg rating and Travis’s 17.5 highway mpg figure. Now, I know what you’re thinking. You’re thinking: That is some of the worst gas mileage I've ever heard of, and you should be ashamed. And I want to agree with you. Really, I do. But when I saw the little display go above 17 miles per gallon, I was ecstatic that the car was performing so well. This is life when you have a 556-horsepower station wagon. In a mix of maybe 65 percent city driving, 20 percent back roads and 15 percent highway, I see anywhere between 11 and 13 mpg on a usual basis, which fits in just below the EPA’s combined figure of 14 mpg. Therefore, the conclusion here is obvious: if you have a CTS-V Wagon, the best way to think about gas mileage is simply not to measure it.